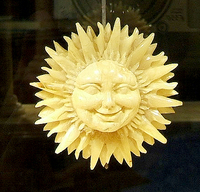 We’ve just returned from the Twelfth International Amber, Jewellery & Precious Stones Fair in Gdansk. There is no other event in the amber jewelry industry quite like Amberif- it is truly a showcase of every available design under the sun in amber jewelry & offers insights into the latest amber jewelry trends for the new year. People come from literally all over the world to meet with over 400 amber producers- from single artists, small family run companies to the very largest amber companies- from world famous minature amber instrument makers to amber bead specialists- as well as scientists, designers, craftsman- If they are serious about amber jewelry, you will find them here. We are sorry to report that the Fair was only lightly attended this year, as compared to other years. This was Andzia’s tenth trip to Amberif! In fact, it was a bit of a ghost town for all three days with hardly any foreign nationals attending. It certainly wasn’t due to a lack of marketing inside the country- we were invited to a very glitzy reception at the new Amber Centre that featured remarks by the mayors (called "Presidents" in Poland) of the Tri-Cities- Gydnia, Gdansk & Sopot. In fact, before we could even get our coats off we were whisked away for a red-carpet tour of some of the very modern offices. When I say glitzy, I mean glitzy- as in suckling pig with an apple in it’s mouth glitzy- Mercedes Benz & Hevelius vodka were among the sponsors- here’s a photograph of just one wing of the Amber Center! 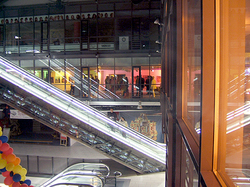 As you can see, it is housed in a giant, brand new shopping complex. We were told the charming & real story behind naming the Manhattan Mall- For context, what you need to know is that the Gdansk Amber Centre has been in the works for over 15 years. During much of that time, the land on which it now stands was covered by little open-air market stalls, strictly built out of wood, so as not to be permanent. The Poles referred to it as "our Manhattan," thus the name. The evening was filled with PR types & got great television & radio coverage- so much so, a review of the evening was being featured on the radio in the taxi we stepped into on Friday morning! The cab driver asked if we had attended & flashed us a giant smile when we indicated we had. 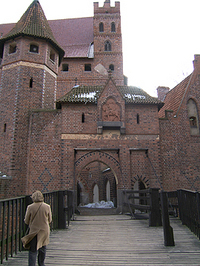 We ourselves had a wonderful trip & accomplished almost everything we wanted to, including a trip to Malbork Castle. However, we couldn’t help but note several general business developments industry wide which are reason for concern. Unfortunately, one of our very best friends & contacts in the amber industry in Poland could not meet with us- but it was for a very happy reason- the birth of his second child, a boy! So we are still waiting for the inside scoop on a few burning questions, which we’ll post as they come available. We’ve worked our fair share of shows that had poor turnout & we believe attendance was markedly down for a combination of reasons. First, the dollar is simply decimated abroad & raw amber prices are sky high. It was universally reported that amber cabochons of respectable size are hard to obtain & this absolutely tracks with conversations we’ve been having with our designers since early fall of last year. We noted that raw amber producers who are usually present did not have a stand this year. Another distinct change we noted was the fact that nice amber beads were almost totally absent from the Fair. 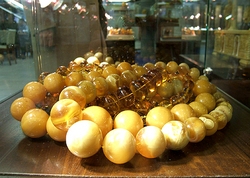 An alternate amber fair was organized in Lithuania in the few days before this fair- which has an emphasis on amber & sterling silver jewelry, but even the big-dog amber bead producers had far fewer amber beads than normal with markedly less variety. In terms of business, we’ve always wanted to carry more amber beads but were always bedeviled by three reasons- one, the sheer variety, two, the cost & three: quality. In hand with quality is always the question of trust: are these beads genuine? Amber beads are quite expensive even at the wholesale level & semi-precious beads can only command what the market will bear- so it’s just difficult for anyone to carry a serious selection & we find the sticker shock is more than the market can realistically bear. Anyway, onto the question of general design. The strong point of this edition of Amberif was definitely design & we found several companies we are very excited to begin cooperation with- You’ll start to see many of these designs in early summer. The amber industry, more than other jewelry segments, has always tended to mimic one another rather than look outside itself into the world of street fashion & we are very happy to report this is changing at long last. New designs include a serious emphasis & return to natural amber & a move away from tri-color amber designs. Happily, many lovely tri-color designs are still available in production jewelry, so they won’t be disappearing entirely, but there is a real energy that can be felt in the return to natural amber.